Bloom Where You're Planted is a full-day orientation to living in Paris for English-speaking expats from around the world. Bloom is designed to create opportunities for meaningful connections with others and provide valuable insights that will enable individuals and families to grow and thrive in Paris. 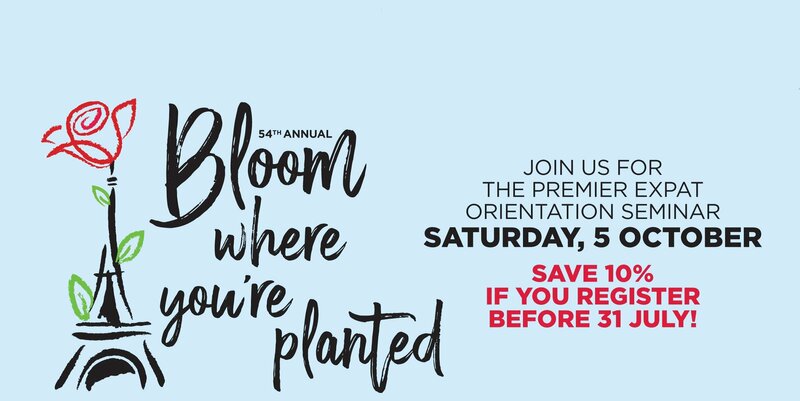 The BLOOM event will feature keynote speakers and focused seminars offering inspiring stories and practical attention to topics such as education, cooking, and real estate, healthcare and more. An extensive Exhibit Hall will connect you with organizations offering opportunities and services for the expat community. And, of course, an introduction to Parisian life wouldn’t be complete without delicious food and wine. Childcare and a kids program will be available for ages 6 months to 12 years.